Companies can choose from an overwhelming number of international standards, published by International Organization of Standardization (ISO). 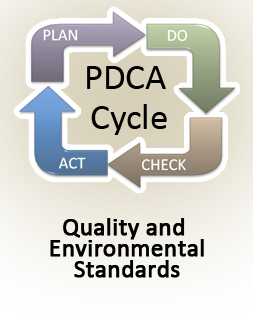 Just to start, you may apply for ISO 9001, ISO 14001, AS 9100, ISO 13485, TL 9001, ISO/TS 16949, and ISO 45001. You may also want to combine or update any of these standards. ISO 9001 Quality Management Systems This is the basic international standard of fundamentals for a Quality Management System. It can be used by any organization of any size, and is the foundation for other industry standards. ISO 14001 Environmental Management Systems – Requirements with guidance for use Based on ISO 9001, but to provide organizations with a framework to protect the environment and respond to changing environmental conditions in balance with socio-economic need.